Granite, gritstone, sandstone: After a day at the crag a climber’s hands can look pretty rough. If you plan to climb again the next day, you hopefully have some Climb On! hand care along to repair those fingers. And also cyclists and hikers will find Climb On! 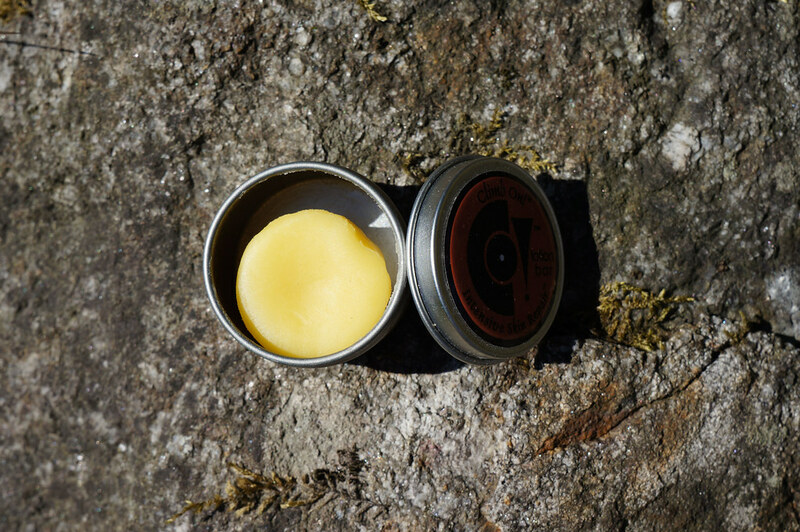 superb to treat rashes, burns and blisters on the trail. The first time I tried Climb On! was last year at Havukallio, where some friendly Estonian climbers let me try the Climb On! Bar to treat my fingers. I immediately loved the smell, and was very surprised how good it heals the tips of my fingers and my palms. Climbing with broken-but-healed skin the next day went well, and so I quickly got some Climb On! from Boulderkeskus. Climb On! is a pretty sweet skin care product. It’s all natural - so free of synthetics and petrochemicals - and consists of bee wax, grapeseed oil, apricot kernel oil, organic shea butter, essential oil of lavender and several more natural ingredients. It comes in two variations: The bar (available as a 14 and 28 g can) and a creme. I tested both and find them absolutely superb - in fact, I use them almost daily. The bar is always along when I go climbing, so I can wax up my finger tips and palms before I head home or in between breaks. Your skin does need some time to soak up this the wax, so it’s ideal to apply it before a longer afternoon siesta. And after a long day at the crag it’s already a ritual to get the Climb On! bar out, wax up the fingers and then pass it on before cracking open a beer. It’s fairly long-lasting and even with regular, daily use the small Mini Bar probably lasts two to three months. 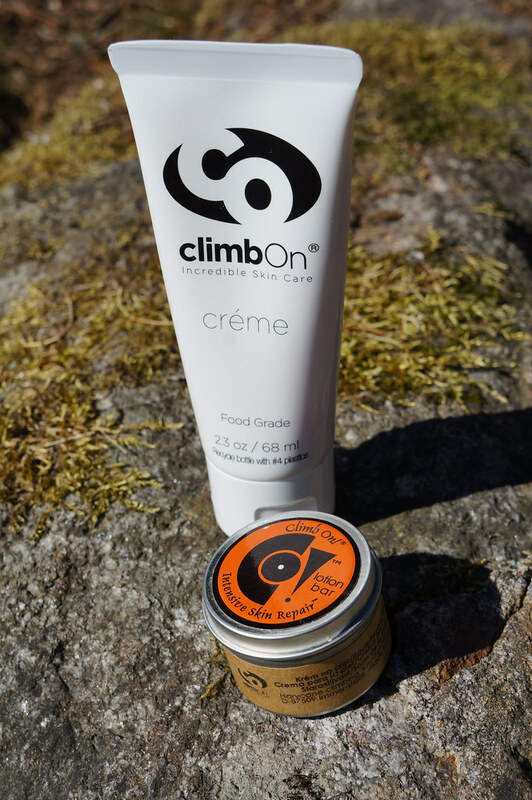 But not just for worn climbing hands these skin products are superb. On my backpacking trip in Luxembourg last week I injured my foot on the second day, impaling the underside of my foot with the result being a deep, bleeding gash. As my FA kit is rather minimal I cleaned the wound with an anti-septic, moist tissue and then, out of curiosity, applied some Climb On! to the wound before going to bed. The next morning the wound looked much better, and through daily appliance of Climb On! to the wound it has within a week almost completely healed. Just afterwards I read up that it is indeed also recommended for the treatment of all kind of skin problems, from burns, cuts, rashes, cracked cuticles and heels, road rash, rash, poison ivy and much more. The Créme I use at home, and it’s made from the same natural materials as the bar. It has also this delicious smell and is rather excellent for dry hands and skin. For the trail you can easily fill it into a small 15 ml bottle and have enough along for a week. I’m not big on cosmetics and long ago abandoned the use of pretty much all cosmetics, but because my flayed finger tips and palms hinder me from climbing I found Climb On! a superb product to be able to climb also the next day after a hard session. As it’s all natural and uses no chemicals I also rate it as not dangerous and fine to use. And as it’s working well also with blisters and small injuries I now will also always have a small dose of the Créme along in my FA kit when backpacking! You can get your Climb On! Bar and Créme at the Boulderkeskus Webshop and also from Bergzeit, CampSaver.com, REI and Bergfreunde.